Enjoy newlywed bliss together in paradise! The Caribbean and Mexico offer scenic backdrops of turquoise water, floral gardens, sparkling waterfalls, pristine beaches and majestic mountains. Whether you need an intimate wedding for two or an extravagant festivity, we will coordinate the wedding of your dreams while saving the most amount of money along the way. Our Wedding Portal provides you with a custom wedding page; a place to post your story and a simple resource invite your guest and let them book their trips online. The Wedding Portal keeps everyone on the same page eliminating the hassle which allows you to focus on the finer details of your dream wedding. Start planning your destination wedding today! 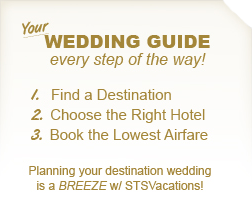 Call 1-866-875-4565 to speak with a destination wedding specialist or submit your request online.